Flood waters caused by hurricanes, rising rivers from torrential rains, and other natural disasters leave a wake of destruction. After the immediate cleanup, workers are left a major health hazard — mold. 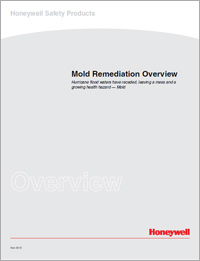 To help workers protect themselves from the hazards of mold exposure, Honeywell Safety has published a “Mold Remediation Overview.” The document is available to download (.pdf file) from the Honeywell Safety website. Molds are fungi that can be found anywhere, growing on virtually any substance. All that is needed is moisture, oxygen and an organic source. Any remediation work that disturbs mold and causes mold spores to become airborne increases the degree of exposure. While many molds are innocuous, other molds can be extremely toxic — causing respiratory and other disorders. Inhalation is the route of exposure of most concern to flood cleanup workers. There are no U.S. government standards or regulations for exposure. However, government agencies have provided guidelines on personal protective equipment for workers. The level of protection recommended increases with the size and scope of the infected site.